Zedomax DIY119 – Make Christmas Light controller in 5 minutes! Okay, today we are going try to build a computer controlled Christmas Lights in 5 minutes. Update: Garrett’s Voice Activated Christmas Controller is now available! one green, one black, and one white. “FG”, which is frame ground so your house does burn down. 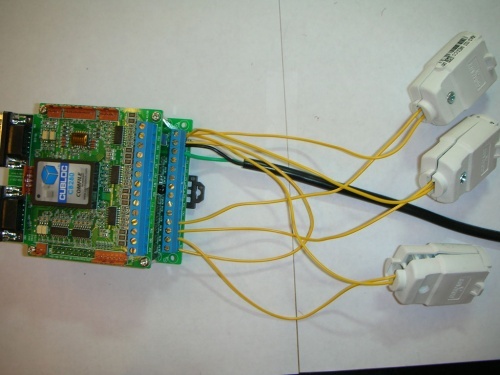 Then put the other Black and White wires onto the terminal headers as shown below. 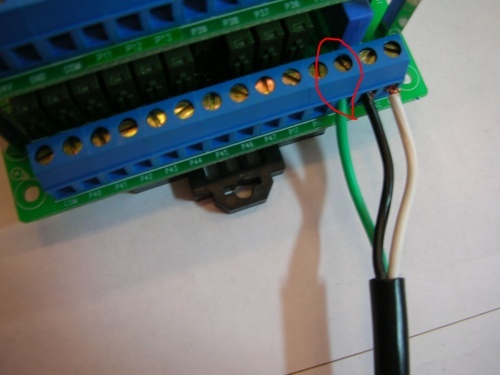 Leave them unscrewed and only screw in the green wire if you haven’t done so in Step One. Connect from CUSB label, P40, to one of screws on the AC connectors. Polarity doesn’t matter so any of the two screws will work. Do the rest of the AC connectors. Connect from CUSB label, P41, to one of screws on the AC connectors. and also connect from CUSB label, P42, to one of screws on the AC connectors. to the other screw on the AC connectors for each of them. When you are done, you should have something like below. 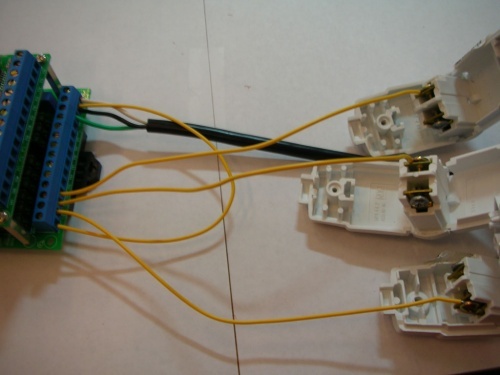 Connect some Christmas lights to each of the AC connectors. 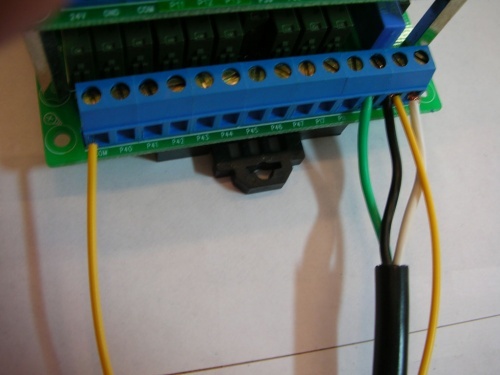 Then connect the serial cable to program the unit. Copy and paste the following code into CublocStudio and download to your CUSB. Well your lights should be working pretty good now. time it so it is animated. 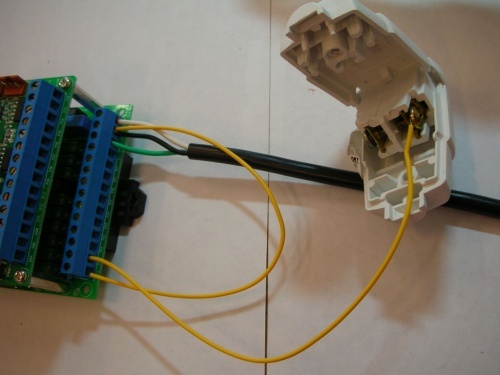 25 Responses to Zedomax DIY119 – Make Christmas Light controller in 5 minutes! 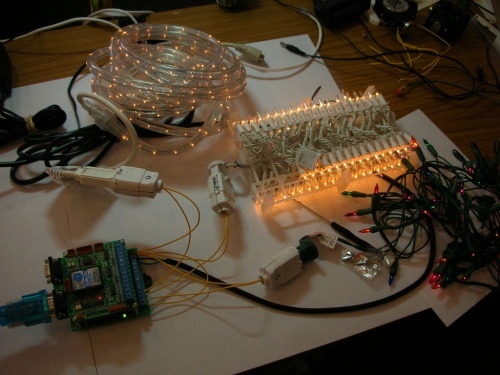 Pingback: Comfile Technology Blog » How to make Christmas Light controller in 5 minutes! $129 seems expensive. for a “static” programmed controller. Take a look at www.d-light.us for a fully featured controller. I prefer playing with my toy cars and lorries on my play mat, Although being an electronics geek i think i may just be able to sort this pcb out myself as long as mommy and daddy hold my hand for me when i go to plug it into the wall. If i decided to make one of these units and i got electrocuted would you pay off all of my bills?? hola solo quiero saver donde puedo conseguir este sircuito en mexico agradeseria me ayudaran Bye. Very stupid question from a beginner but can the CUSB22R’s output AC voltage be controlled so that Christmas lights can be programmed to gradually brighten and then dim to nothing. I would like to get various single colored strings, one per channel and have them one by one gradually brighten, then dim and then the next color would brighten so that it appears the lights are changing colors. Thanks in advance for your time and patience if this is a dumb question!! Unfortunately the relays on the CUSB22R cannot control the brightness. There might be a way to hack it but I have not tried it and cannot recommend it. But you might be able to send an email to Garrett@zedomax.com who might know further about this. 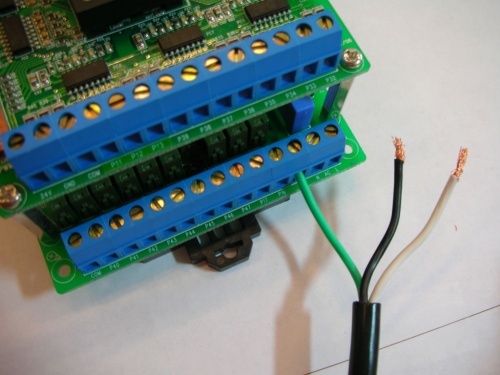 Wow, I’ve wanted to do this for some time but most tutorials involve solid state relays, complicated soldering, I am definatley going to try this, I’ll order it when I get my pay check tomorrow. 2 Questions kinda as fodder for people reading this but also if anyone knows the answers and would like to assist. 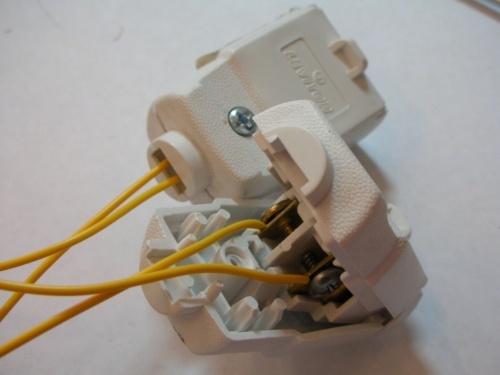 It looks like as an alternative to the Ac Connectors one would use the typical wall plugs you can get at home depot for about $.42 ea since you are just connecting the wires is that true or would that accidentally set my house on fire? With those and the available coverings you could make a sweet base board to mount everything on.and what is the maximum number of lights you could have on this? Thanks for this awesome tutorial! What kind of program is used to program the lights? I used BASIC code, which is a slightly modified version for embedded computers, you need to check out http://cubloc.com for that. Basically their computer chips allow you to code in BASIC, pretty much going back to the 80s, a lot easier than C or C++. can the cusb-36R also be used to do this? or can the cb280 proto board be used? Of course, you will need to hook up the relays to the CB280 though, I find it much easier with the CuSB units because they are pretty much same thing with relay embedded. and do you know any programs i could use to sync the lights to music? Yup, any of the CuSBs can be used, this one is just used as example. is there anything with USB capability? it doesn’t “Remeber the sequence”? yes go to parallax or radio shack and look for a usb to serial adapter. Is this possible to make in England?